The human-animal bond has the power to change lives. Even behind bars. Since 2005, the Pen Pals of San Quentin program has been helping nonviolent, specially-selected inmates learn how to help dogs overcome medical and behavioral issues so they can be ready to find their forever home. These pups need quality time with a person — and time is something the inmates have in abundance. The prisoners have also proven to have big hearts and are definitely up to the task. Pen Pals began after Larry Carson of the Marin Humane Behavior & Training department learned about a program called “Cell Dogs,” which placed dogs with inmates for rehabilitation and of the love the animals and men gave each other. Given Marin Humane’s proximity to San Quentin prison, Larry knew this would be an ideal project. When the San Quentin Warden embraced the proposal, it moved forward with amazing speed. Pen Pals inmate handlers work in the prison Firehouse either as firefighters or emergency first responders. They must have a clean behavior record and absolutely no history of animal abuse. The inmates who’ve participated in the program gain self-esteem, learn new skills, and get to see their dogs’ progress and eventual adoption into their forever home. By taking care of their dogs’ needs 24/7, they develop more empathy. And the inmates who’ve participated have a much lower recidivism rate. Pen Pals truly is a win-win for dog and man. This program is funded through generous donations and grants. To date, more than 300 dogs have graduated from the program and more than 55 inmates have participated. What is Pen Pals of San Quentin? Why did Marin Humane start this program? Where have some similar programs been implemented? How do the inmates and community benefit from Pen Pals? How do you choose the dogs for the program? Who were the first dogs to go through the program? How can you trust the inmates with the dogs? 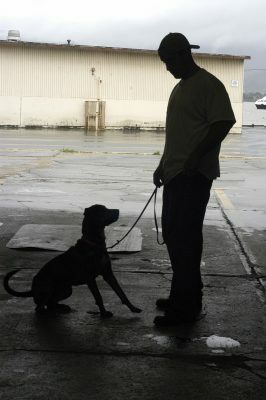 Pen Pals of San Quentin is a unique program jointly operated by Marin Humane and San Quentin State Prison in which selected inmates learn to socialize and train dogs to prepare them for placement with families in the community. Marin Humane is a community-based shelter and this program will enable more animals’ lives to be saved while, at the same time, making a difference for the community by providing a positive program for our resident prison. Marin Humane rehabilitates dogs medically and behaviorally to make them better adoption candidates, and this often requires a lengthy stay in a foster situation. The dogs need someone’s time – and the inmates have it! So the dogs benefit by being with their handlers 24/7 and becoming better socialized and better trained so that they’ll fit in easily with their future adoptive families. Because the Marin Humane Behavior and Training Department is a large one, with 20 dog trainers and 60 dog training assistants, it’s well equipped to handle the needs of such a program. From our experience, we know that participating inmates benefit from increased self-esteem from learning new skills and seeing their dogs progress and be successfully adopted into new homes, and that they develop increased empathy by taking caring of their dogs’ needs around the clock. In some cases, the skills the inmates learn may even translate into helping them find work after leaving prison. The prison benefits from the addition of a new incentive to keep inmates on good behavior. Participating in this program is a privilege requiring a perfect behavior record for the one-year period prior to being considered for the program. Plus, participating facilities generally experience a marked decrease in tension and violence with the introduction of the animals. The community benefits because when the participating inmates leave prison, they leave with a better attitude and their risk of recidivism is lower. The dogs are chosen by the Pen Pals coordinator in consultation with our veterinarians and behavior and training department director who are seeking adolescent dogs who need to learn manners, shy dogs who require more socialization, and dogs with health conditions, like heartworm, who need a place to convalesce for several weeks. No dogs with aggression issues will be considered for the program. Our trainers are in close contact with the inmates and the inmates log notes about the dogs’ daily progress and behaviors which the trainers then monitor. Prison officials also closely watch the interactions between inmates and dogs. Program expenses — for all food, toys, crates, vaccines, vet care, beds, grooming supplies, some fencing — are covered by Marin Humane from donations and grant funding. Our annual Pen Pals budget is approximately $15,000 — low costs for such high payoffs — and at no cost at all to taxpayers. If you are interested in funding opportunities for this program, please email or call 415.506.6257.